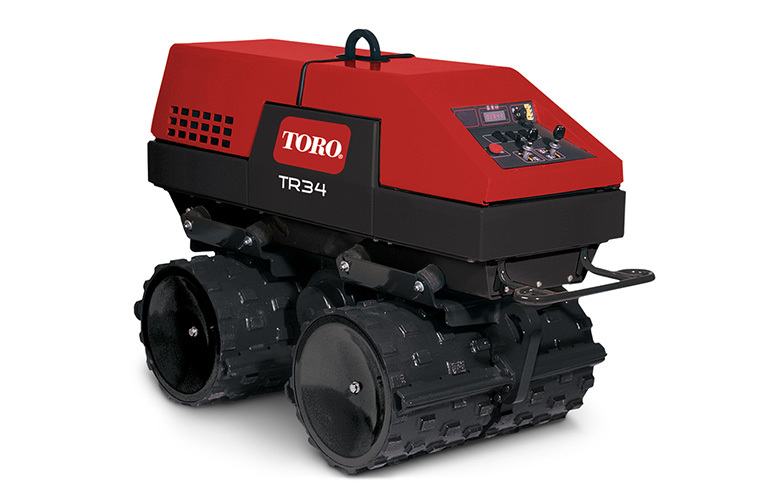 Toro's TR 34-D diesel trench roller combines superior maneuverability with powerful performance and produces optimal compaction above and below ground. The TR 34-D is built with heavy duty shock mounts that isolate the operator, battery, electronics and engine from vibration for extended life. The fuel tank holds 3 gallons of diesel which will let you operate for 5 hours at a time. An anti crush safety device prevents operator from getting hurt once the operators body pressure presses against the safety bar. Interchangeable drums allow for quick changing for different trench widths and the Toro TR 34-D comes with a light weight remote control for easy driving. This trench roller gives out 15,709 pounds of eccentric force and can compact 10,798 square feet an hour. The roller is powered by a Hatz 2G40 diesel engine and has a low speed and high speed vibration settings. The drum is 34 inches wide, gives out 2000 vibrations a minute and weighs 3,100 pounds. $0 down and no payments for 120 days on Toro Trench Rollers!